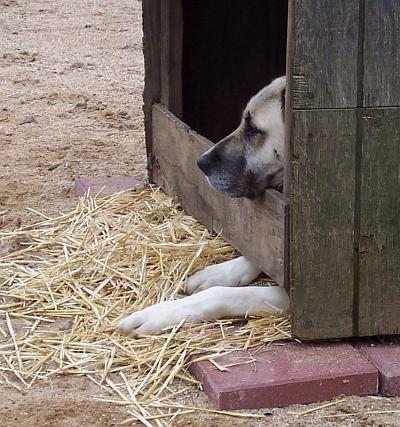 This is our girl Zor, enjoying the view from one of our two oldest (teenaged, at least) and larger dog houses. The house got moved to a new area on top of some crushed granite and it hasn't been completely rebuilt yet. The old 'retaining wall' that (theoretically) keeps all the straw bedding from spilling over the board is missing a board below. Happily nestled down with soft straw and a good chin rest!